For Chicago's Red Clay Dance (RCD), dancing has meaning beyond entertainment or storytelling; it can also has sociological impact, by "advancing the avenues that dance uses to contribute to improving cultural and socioeconomic issues." This weekend, the dance company, based in the city's Hyde Park neighborhood, will celebrate its fifth anniversary with its fall concert Transcending, which will feature a company repertory piece, Gone 2 Soon, and the world premiere of On Hallowed Ground. 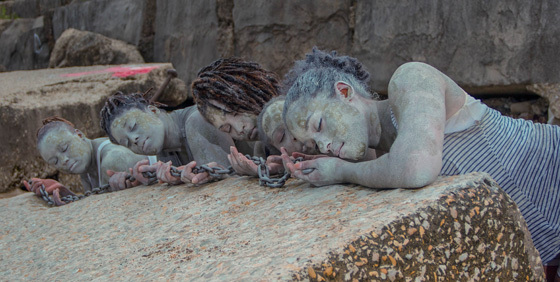 Choreographed by RCD founder and artistic director Vershawn Sanders Ward, and performed to music by Chicago-based composer Alpha Diallo, On Hallowed Ground, a "half-evening length" piece inspired by sculptor Jason deCaires Taylor's Vicissitudes, pays tribute to the history of the many lives that were lost during the Middle Passage, by "capturing souls through movement, song, and text." Gone 2 Soon, an existing work that evolved as a result of the Trayvon Martin case, explores the emotional aftermath of the sudden loss of a loved one. In addition to the dance, Transcending will also feature "My Sister's Keeper," a performance by Chicago-based Ayodele Drum and Dance, an all-female artistic company. See Transcending Friday, Oct. 18 at 7:30pm and Saturday, Oct. 19 at 7pm, at the Reva and David Logan Center for the Arts, 915 E. 60th St.; tickets are $15-$20 and can be purchased online or by phone at 773-702-ARTS (2787). NOTE: Tickets for the Saturday night special VIP package are $40; this includes a pre-show reception from 6pm-7pm, reserved auditorium seating, and a post-show cocktail reception.